Wireless connectivity is inherent to IoT, and while most IoT solutions rely on local, personal and proximity-based connectivity (e.g., Zigbee, Bluetooth, Wi-Fi and RFID), there are currently over 300 million IoT devices that use wireless wide area networks (WWAN), provided primarily by mobile operators. Tolaga Research forecasts that the number of connections will increase from 300 million to 1.45 billion by 2020, and 4.63 billion 2025. Until recently, mobile networks have essentially been the only game in town for WWAN IoT connectivity. However, this has changed in recent years with the emergence of low power wireless access (LPWA) solutions. These solutions consist of a variety of proprietary and standards-based technologies that operate in unlicensed radio spectrum. Solutions are offered by companies like Ingenu, Link Labs, M2COMM, NWave, Qowisio, Semtech (LoRa), Silver Spring, Sigfox and Telensa. In the last 18 to 24 months, the mobile industry has responded to LPWA competition by feverishly developing licensed spectrum solutions designed specifically for IoT. This has culminated with standardization efforts for EC-GSM/GPRS, LTE Cat 1, and LTE Cat M1 and M2 (aka NB-IoT) technologies. It has also heralded plans for NB-MuLTEfire, which is currently being proposed as a “crossover” technology for unlicensed operations. With so many alternative WWAN solutions, not all will achieve sustained market success, particularly with growing competition from licensed spectrum technologies. Although the LPWA market is nascent, Sigfox, Semtech (LoRa), and Silver Spring’s Long Range 802.15.4 solution have gained the greatest market traction to date. However, growing competition is coming from other players like Ingenu. The business models adopted by these and other LPWA providers are diverse and are impacted primarily by the incumbent positions of the players and technologies involved. Sigfox and Ingenu have vertically integrated business models and maintain a tight leash over network deployments. This contrasts Semtech, whose LoRa technology can be purchased off the shelf and is being deployed by both private enterprises and commercial network providers. While LoRa is a proprietary radio technology, it is supported by LoRaWAN, which provides a standardized MAC and application development environment. In some cases, LoRa operates with modified MAC and application layers, such as is the case for Link Labs’ Symphony solution. Silver Spring has large scale smart-meter deployments and is extending its solution to support a variety of smart city applications. Sigfox uses a simplified radio technology to enable ultra-narrow-band connectivity (100 bps), this contrasts LoRa, Ingenu and the Long Range 802.15.4, which utilize spread spectrum technologies and can operate at a variety of rates depending on the channel bandwidth and spreading factor that is used. As technology vendors promote their respective LPWA solutions, exaggerated performance claims are rife, in many cases to the point of ridiculous. For example, technology vendors simultaneously quote unrealistic network coverage capabilities, while at the same time touting stellar device energy efficiency. In reality, these are mutually exclusive. Other players compare the performance of practical spread spectrum and idealized narrowband systems, without accounting for practical implementation constraints, such as frequency drift and the optimum sharing of unlicensed spectrum resources. Advocates of spread spectrum technologies tend to overly optimistic in terms of network coverage and interference mitigation. In addition, performance estimates are commonly based on radio propagation models that fail to address the impact of signal variability in practical operating environments. We developed several simulation tools to investigate the impact of changes radio propagation, coverage and interference conditions on IoT network performance. We presented several simulation results for LoRa under various operating conditions. Comparable trends are observed with other IoT networking technologies. LoRa uses a spread-spectrum radio technology that has several different classes of operation, channel bandwidths; and spreading rates that range between SR6 or SR7 and SR12. SR6/SR7 operations have the least processing gain to enable the highest data rates under ideal radio propagation conditions. High SR rates — up to SR12 — are used when larger processing gains are needed for more challenging radio propagation conditions, albeit with lower signal data rates. Exhibit 1 illustrates the impact of the network density on the performance of a LoRa-based IoT system operating in 900 MHz unlicensed spectrum. 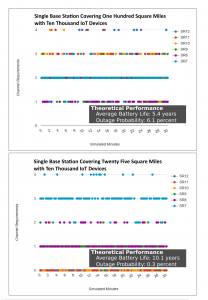 Both cases shown in Exhibit 1 consider a single base station that supports 10,000 IoT devices that each transmit a message of 35.25 bytes. Messages from each device were randomly sent within the 30 minute simulation period shown. 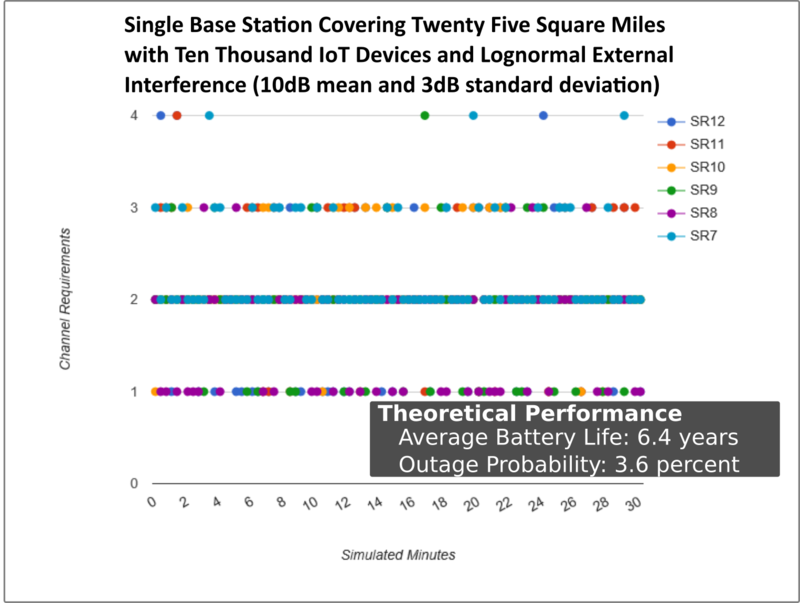 For the purposes of the simulation, the IoT devices were placed randomly throughout the coverage area, and the path-loss is characterized by an Okumura-Hata urban model having log-normal variability with 6dB standard deviation. 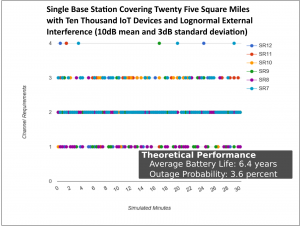 In the case of a single base station supporting 10,000 nodes over an area of 100 square miles, the theoretical outage probability is estimated at 6.1% and average IoT device battery life at 5.4 years. This assumes a 3.3V/1000mAh battery is used and ignores the impact of battery leakage. 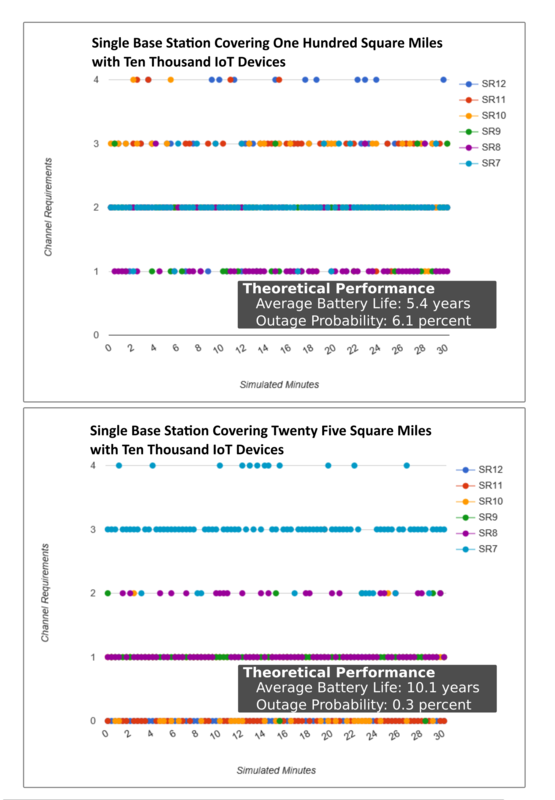 By comparison, a single urban base station supporting 10,000 nodes over an area of 25 square miles has a theoretical outage probability of 0.3% and average IoT device battery life of 10.1 years. In both cases, each base station requires up to four 125 kHz radio channels to function effectively. These channels would need to be adequately planned for multi-base-station implementations. In Exhibit 1, the network performance is considered in an interference free environment. Exhibit 2 considers the case of a single urban base station supporting 10,000 nodes over an area of 25 square miles, which is also subject to log-normally distributed interference that reduces the received sensitivity by a mean value of 10dB, with 3dB standard deviation. In this case, the theoretical outage probability is 3.6% and average battery life is 6.4 years. As LPWA vendors battle for supremacy, we can expect that they will continue to exaggerate their technology capabilities. Enterprises must independently evaluate the claims of their technology vendors and recognize that it is not only the underlying technology, but also its implementation that will determine its performance and associated total cost of ownership. What's the advantage of inserting an Excel chart this way when Microsoft word offers the ability to insert without code? Does this chart have more capabilities than using the insert function? Or is this just for folks who have fun writing code? @LauraKopp - I wouldn't do it programmatically if I do it myself with my specific documents. However, if a program is supposed to generate a Word doc then this code is indeed very handy! Unless this is for doing it dynamically there are other methods I find easier. One reason to do it programmatically would be in the reporting framework for a test automation suite that builds a word document when the suite finishes running. It's nice to know this is possible. And I'm sure it's useful for some. It's even possible that it might come in handy some day. But for now, we're far happier to just insert the Excel file and get on to our real business.